Functional Integration sessions are one-to-one individual lessons where the question revolves around : how do your habits of movement help you, but at the same time stand in the way of doing better? Lessons are particularly useful for specific or long-standing problems. In a typical lesson, you and your teacher discuss this, then you lie fully-clothed on a low table as the teacher’s hands gently support you, suggesting, encouraging and guiding you towards new ways of moving and organising yourself. 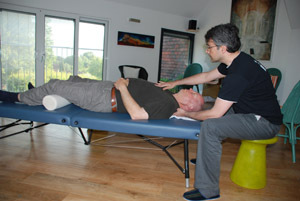 A Functional Integration lesson is a process of the Practitioner exploring the pathways of how you move. There is no sudden introduction of something that would cause discomfort, nor is there any attempt to directly force, or change something that might be “stuck” or uncomfortable. Your own neurological system makes connections from the skill of the Practitioner in following the pathways that are available and potentially useful for your function. A Functional Integration Lesson takes One Hour. Rosemarie & Grahame Morgan-Watson are accredited practitioners of the Feldenkrais Method® following four years of training with the International Feldenkrais Training Centre UK.